Regarding business opportunities, the northmost building demonstrates the rentable stall locations indoors. Over time people could buy up more portions and expand without the liability of renting an entire location at the start. For people who aren't at that point or want something more temporarily placed, they can place the kits between structures or in designated parks such as this one one Vliet Street. 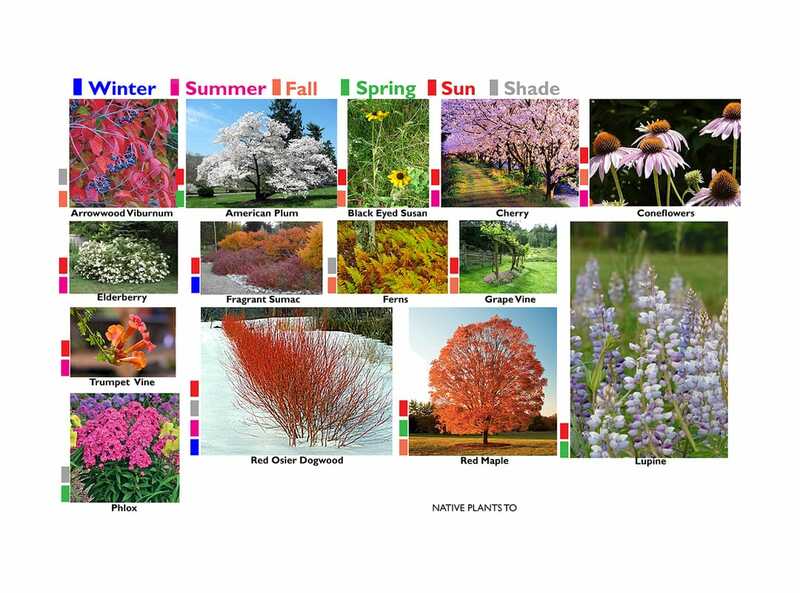 ​There are interwoven native plants, some edible under the right conditions which adds an element of playfulness while adding smells, seasonal shading and color, as well as wildlife such as cardinals. 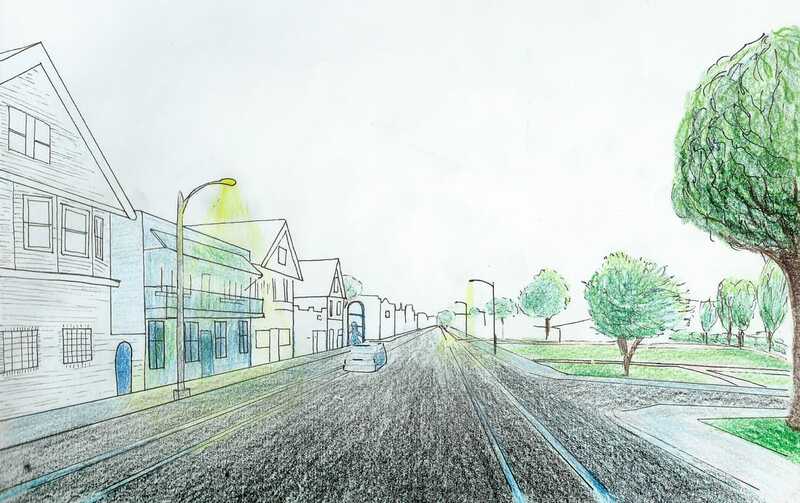 This is a before sketch and highlighted in blue, green and yellow were the places of opportunity focused on Vliet Street. This perspective view of the section below begins to indicate steps for success. The first step to slowing traffic was bumping out the sidewalk to decrease pedestrian crossing distance. The other idea was for it to disallow dangerous passing and speeding as the bump outs would be at every big intersection, without light control. 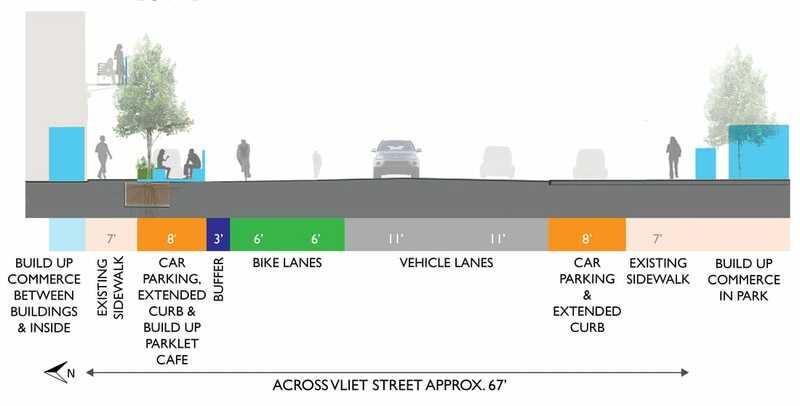 The next importance was to get the wide bike lanes together to create more visibility and predictibility of oncoming drivers. Next over would be a buffer for pedestrians and stopped bicycles as well as extra room for any plantings that act as shelter and protection. Where parking isn't already necessary and as that would grow with more people feeling safe to walk and bike the developement of parklets would grow as well as spaces for build up commerce boxes. I showed the indoor market's outdoor parklet cafe, which would allow for leisurly eating, chatting, or listening to people bring music. Commerce boxes are also shown between buildings and in the park. 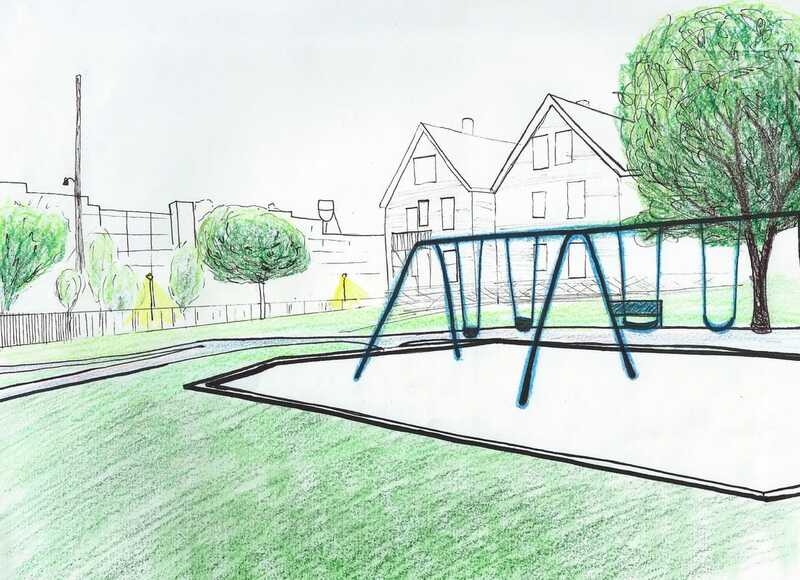 ​This is a before sketch at Foundation Park and highlighted in blue, green and yellow were the places of opportunity focused on. 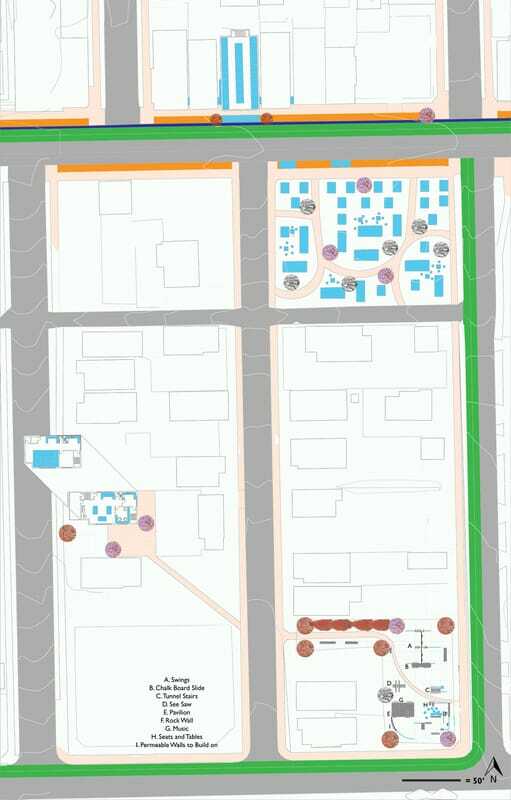 This rendering and section expand on what the plan shows and conceptual configurations shows activities between the permanent functional murals with community add ones. Permanent murals have community members of significance to the area and inspirational quotes from them. Stories come to life in a larger way by creating pieces at the Community Creation Center, shown in plan, because there is raw material for creativity and problem solving. Children get a chance to be a part of the grown up world and learn life skills. I was very inspired by Muneer Bahauddeen’s work, a local artist, that has been very successful and he involves people in his creations. One example is his benches around the community with cast symbols inserted made by the community. It gives meaning and I wanted to expand on that and other local creations, but also focus on play. As the author from "Art as Experience" John Dewey claimed “the actual work of art is what the product does with and in experience.... Order is not imposed from without but is made out of the relations of harmonious interactions that energies bear to one another. Because it is active…order itself develops… Order cannot but be admirable in a world constantly threatened with disorder... For only when an organism shares in the ordered relations of its environment does it secure the stability essential to living. And when the participation comes after a phase of disruption and conflict, it bears within itself the germs of a consummation akin to the esthetic." He made clear that everyone has a singular experience based on their background, a personal narrative with a beginning, middle, and end with a personal tempo. 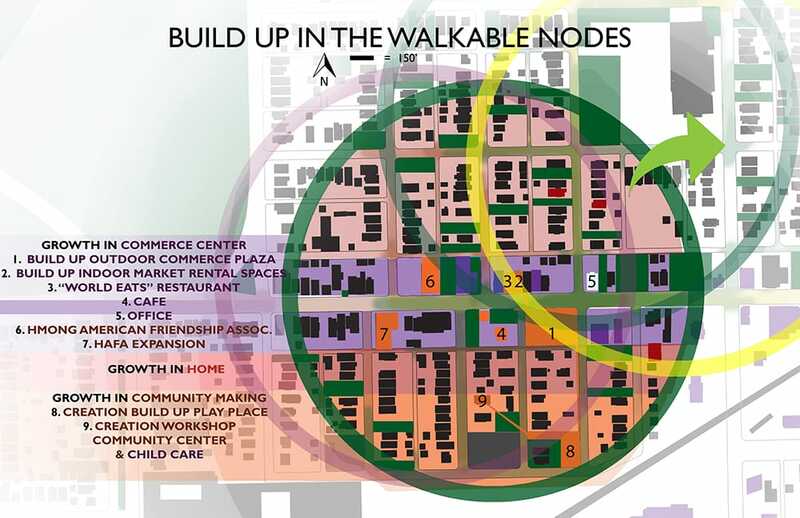 A lot of what he talked about seemed to have a lot of overlaps with walkability therefore creating a harmonious node with hierarchy seemed necessary.